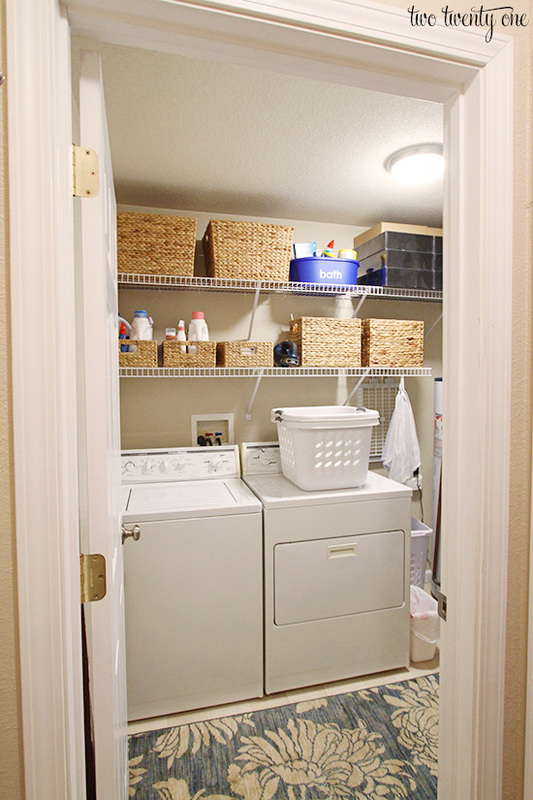 In case you missed it, I shared our laundry room makeover. Today I’m showing how I organized everything that’s on the shelves. I went with woven baskets because I wanted to add some personality to the room and to hide the contents of the baskets so the room didn’t end up looking too cluttered. 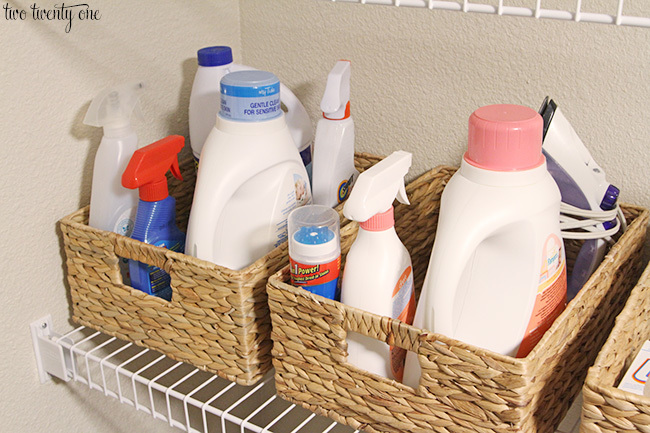 The two baskets closest to the wall on the bottom shelf house laundry stuff– bleach, detergent, and stain removers. Yes, we have five different stain removers. I was on a quest to find the perfect baby poop stain remover. The struggle is real. I also put our iron in the back of the second basket. 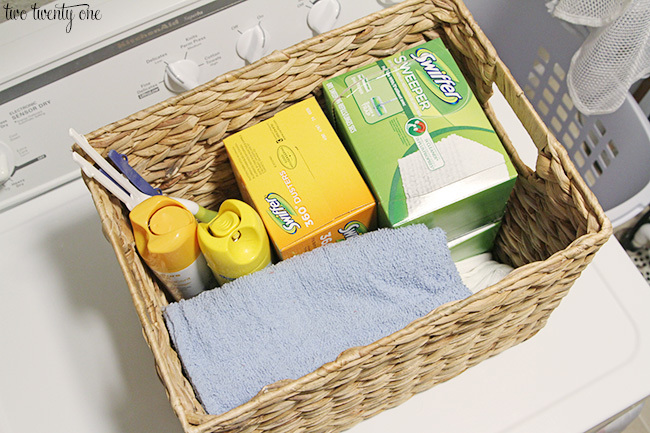 The third basket is where I’m storing our fabric softener sheets and wool dryer balls. 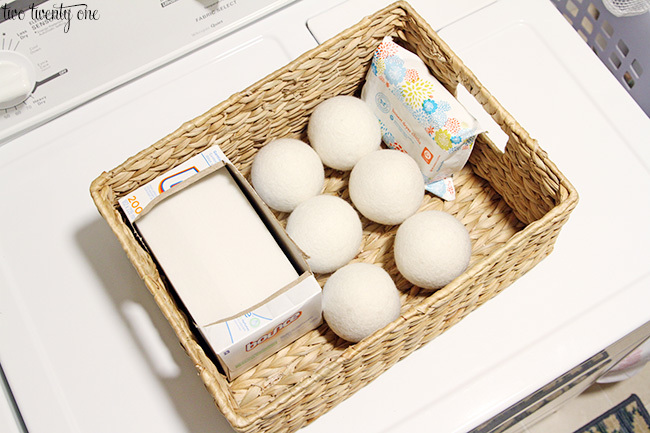 In case you’re wondering, wool dryer balls are natural fabric softeners, and they help speed up drying time. As soon as we run out of dryer sheets I’ll probably switch to using just the wool balls. They’re also good for drying down comforters. I used to use tennis balls, but I think the wool balls are more efficient. I love our RYOBI hand vacuum. We use it a lot so I wanted it in a spot where we can grab it and go so I set it on the bottom shelf. 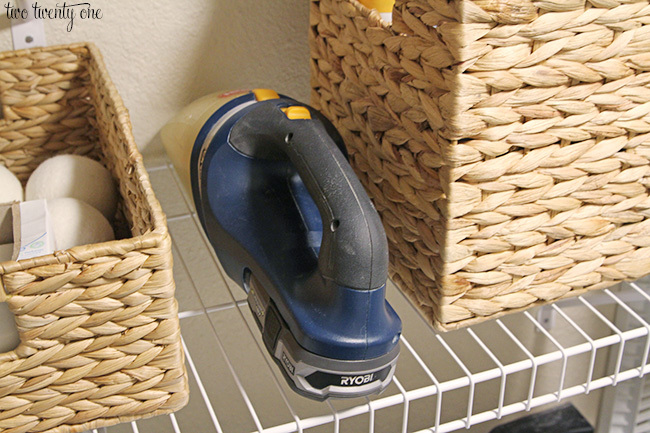 The first medium basket on the bottom shelf houses all of my dusting supplies– Swiffer dusters, Swiffer sweeper cloths, furniture polish, and dusting rags. 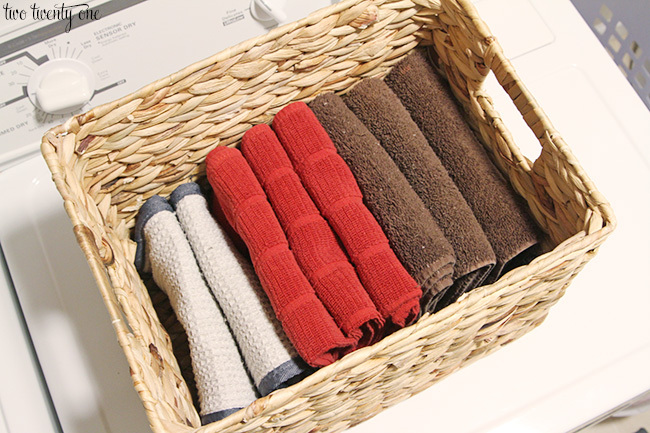 I store our steam mop pads and extra towels for miscellaneous purposes in the second medium basket. 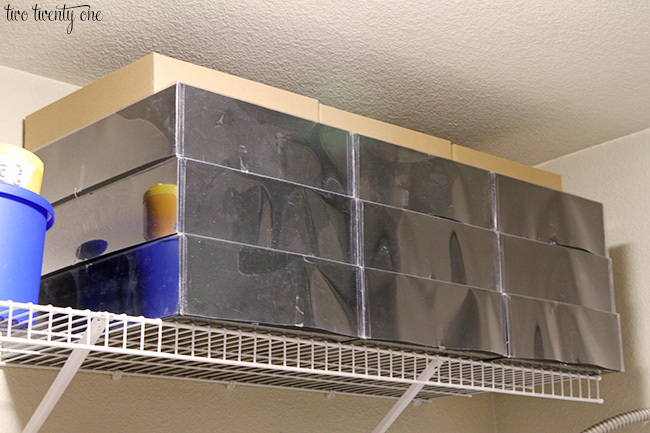 I put our bathroom cleaning caddy on the top shelf. Brad and I are both tall, so we can easily reach up and grab it off the top shelf. I was probably overly excited about adding the top shelf for the sole purpose of storing my glass Christmas ornaments. They had been living in our guest bedroom closet since we moved into this house. But I wanted to free up some space in that closet so now the ornaments will hang out in the laundry room. I would store them in our attic but it’s not climate controlled, and I worry about the super cold temps or blazing hot temps doing something to the finish on the ornaments. 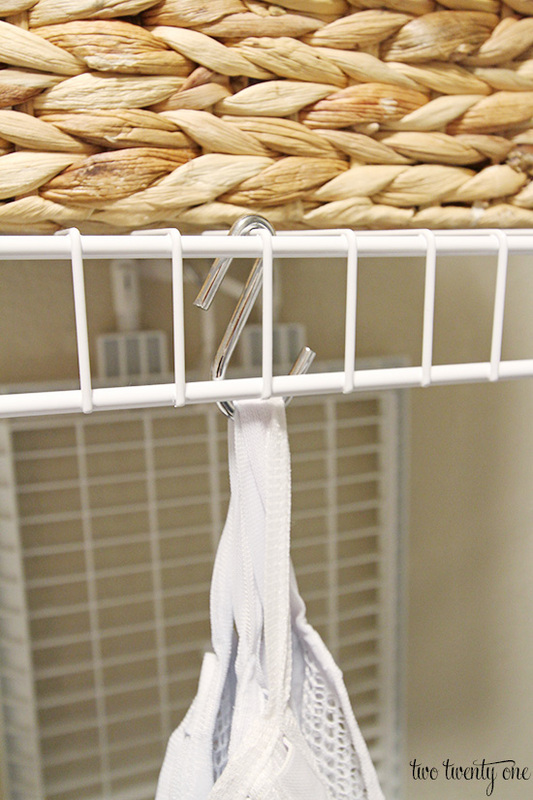 Our dryer comes with this handy rack for lay flat drying. 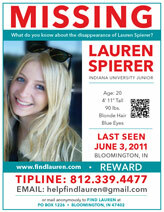 I had it hanging on the wall before, but now it hangs from the bottom shelf with an S hook. I’m a big fan of lingerie laundry bags. They’re my secret laundry weapon (read more about them here). I hang all of the bags on a different hook from the bottom shelf. Now, to be completely honest, the two large baskets on the top shelf are currently empty. For once, I have more space than stuff to fill it with. I don’t know what to do with myself. But I’m sure it won’t take me long to fill the baskets with something that needs a better home. i;m hoping to clean out, organize, etc. my laundry room this year…i was wondering where you find your wool dryer balls? I’ve seen others and also heard about the tennis balls but I’ve not yet used them in the dryer. Hi, Judy! I got the wool dryer balls from amazon.com. Here’s the direct link to them: http://amzn.to/1BSqNj4. I think they’ll be gentler on our clothes and linens than the tennis balls. 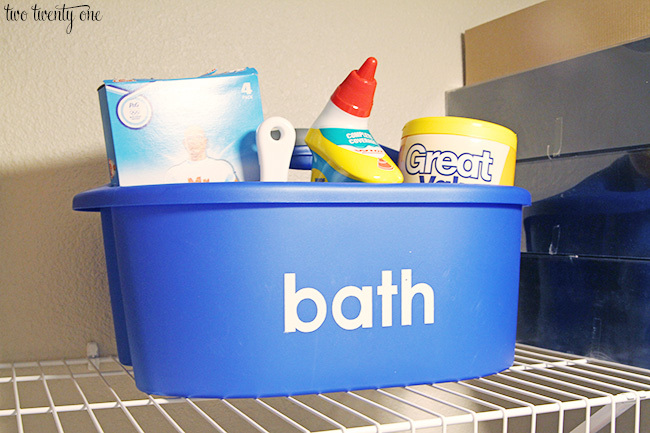 the laundry room is on my list of areas to organize. We have one shelf and a linen closet and I’m at a loss on where to store certain items! My husband loves to buy in bulk so we have tons of detergent and dusting supplies. Right now we also store countless boxes of tissues in there and it just seems out of control! Do you not buy in bulk or do you store the “extras” somewhere else? I absolutely love those baskets! Great job. Currently (renting) our laundry room and pantry are the same room. So we have some strange things on the shelves above our washer and dryer, including board games and bike helmets! Thanks, Natalie! Hah! Make it work! Thanks, Heather! I’ll have to try that. I’ve used hydrogen peroxide on red wine stains before and it’s work great. Lovely! I’m sure that feels amazing to have 2 empty baskets. We’re currently in a dilemma with our laundry closet. We only have 1 long wire shelf and I can’t even reach that. At 5’1″ the struggle is real. The best poop stain remover I found was “grandmas secret spot remover”. Originally found it at hobby lobby in a tiny container but then grabbed a big bottle at hancock fabrics. It does feel amazing! Aw, you need a step ladder. No shame in that– we have one and we’re 5’10” and 6′. Thanks for the tip! I don’t think there’s a Hancock Fabrics near me, but I’ll have to keep my eyes peeled for that. It’s actually on amaon prime! Woot! Awesome! I’ll look for it! Looks great Chelsea! Our laundry room is teeny tiny (literally a sink, washer and dryer stacked, and one cupboard!) so I’m on a mission to make it as effective as the space will allow this year! I love the woven baskets, they look so nice and natural and really bring some texture into the space! 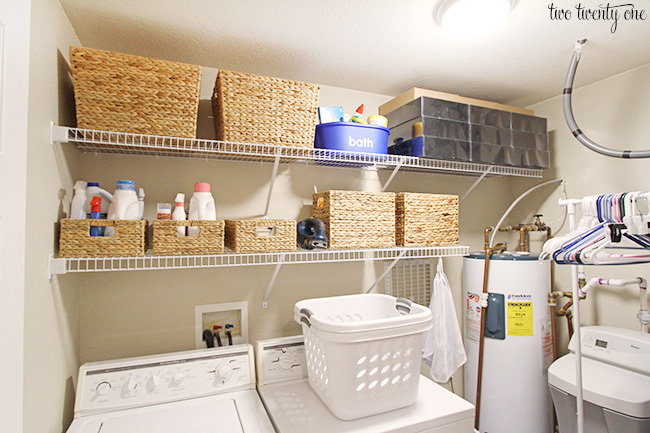 Our laundry room is on my list of rooms that need some organization and a makeover! All of our cleaning supplies are in random spots around the house. Hello! I love your way of organizing – it really fits into my frame of mind! In truth I am using your nursery closet as inspiration, your life hacks for babies, your car backup stuff, your way of rolling baby clothes, etc. One thing my MIL told me to use is Murphy’s Oil Soap for stains. My BIL has Downs (he’s 34) and has “stains” a lot so Murphy’s and then bleach get a lot of poop stains out (and red wine & grease too). Thanks for the inspiration! 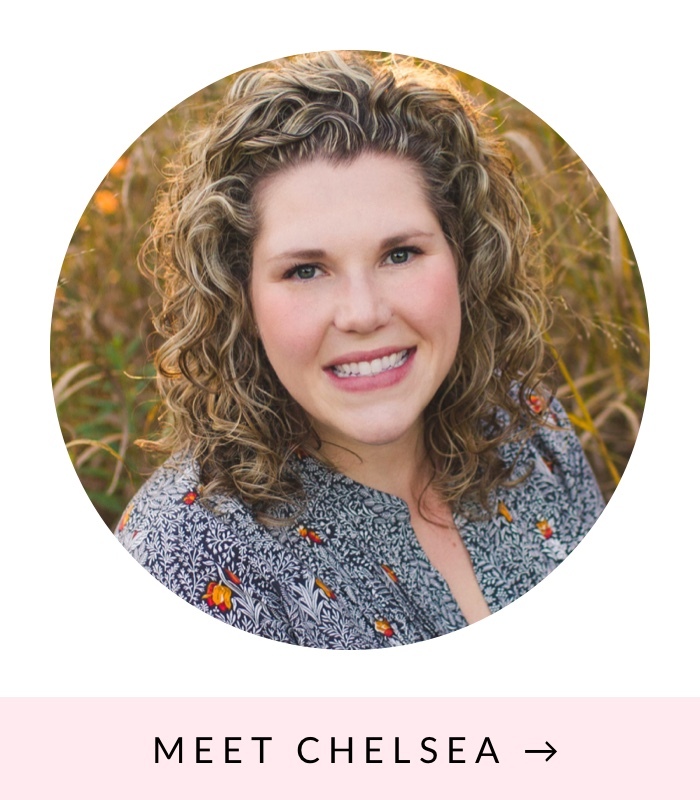 I recently discovered your blog and have like going back and reading it from the beginning… you are like my new younghouselove.com! I’d love to have more space than stuff too! 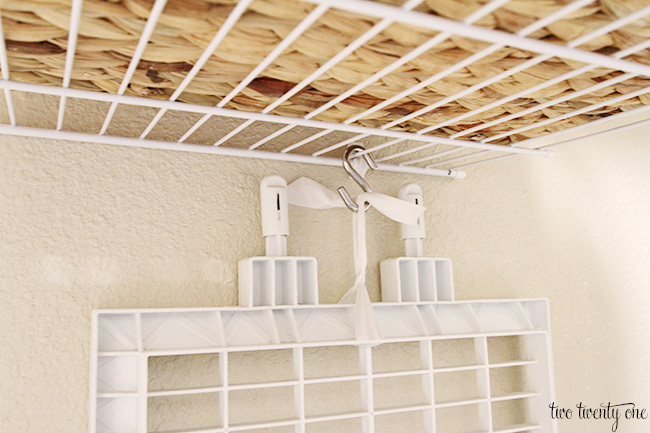 Your laundry room is a great inspiration. It’s sooo organized. We’re thinking of building vertical units too. My wife would love the basket ideas! Looks great! My laundry room is currently in a total state of disarray …… it’s on my to do list. Hopefully I can get mine into shape as well as you have done. Looks great! Where did you find the shorter baskets? Thanks! Hi — This looks great and 2 empty baskets to boot – Wahoo! A comment I wasn’t expecting to make and then a question: First, I saw a mention of Hancock Fabrics. Sorry, it’s filing for bankruptcy shortly and this go-round they are closing all the stores and liquidating the assets in each. Second, you explained in great detail all of the things in your laundry room and I might have missed it, but what is that thing by the vent that looks like a thin pole with a piece of white fabric tied to it? Love you site and your ideas! Looks great. I really want to learn some tips about how to make it goes like that.